MYRTLE BEACH, S.C. — A man swimming in the ocean was injured after officials said he was bitten by a shark Saturday evening at Myrtle Beach. WMBF, in South Carolina, reported that the victim was coming out of the water around 7:45 p.m. near the 2nd Avenue Pier, with a shark attached to his foot. Beach Patrol Sgt. Philip Cane confirmed the bite with WMBF. Witnesses said the victim appeared to be in his late teens or early 20s. 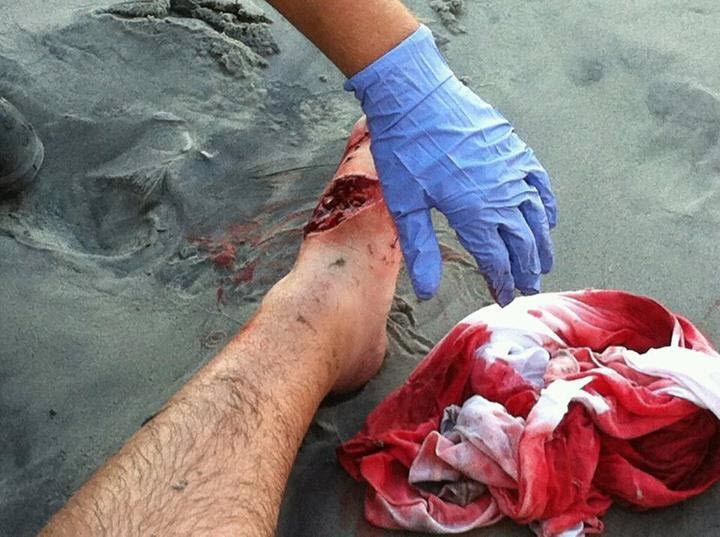 The photo of his shark bite was taken by a friend, WMBF reported. The extent of the injuries remains uncertain. No other information was released. Although tourists and locals are usually informed of the dangers of shark attacks when swimming in the ocean, there are those that will always ignore these warnings and I would not be surprised if this was the case in this Myrtle Beach shark attack. However, I think officials in Myrle Beach should enforce tighter beach patrol measures to ensure that no one is swimming in dangerous waters. How would like the enforcement? Can’t go in the water or just can’t come to the beach period? People are always go to cross paths with sharks as long as they swim it the waters, that’s the chance we all take. The answer is not closing the beaches, the answer is educating the people on what to look for and what not to do. This is going to happen again and we all know it. ” live with it” stop trying to make it something it’s not and stop trying to close the beaches down. Using bee’s or lightning information is what is most people know about sharks and attacks, but it has nothing to do with sharks. In Florida they don’t say shark, sharks are referred to as “sea pests ” and who cares about sea pests or understands what they mean or are. Better education, but where does one find it?